Need to make a precise measurement or adjust a tool? 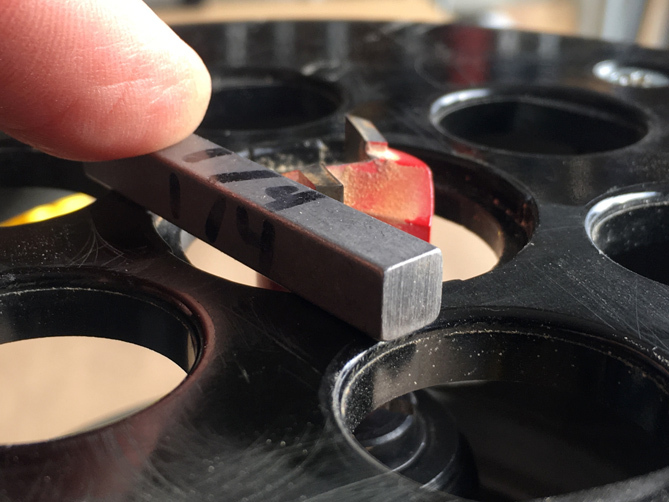 Get yourself a set of square shaft keys. 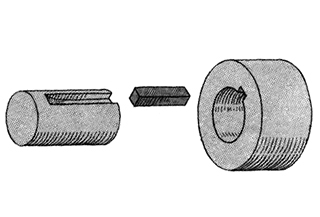 Shaft keys are used in the world of machinery to connect a shaft to something that rotates but we won’t be using them for their intended purpose. Rather, we’ll make use of the fact that they are made in precise metric and imperial sizes to use them as a measurement aid. 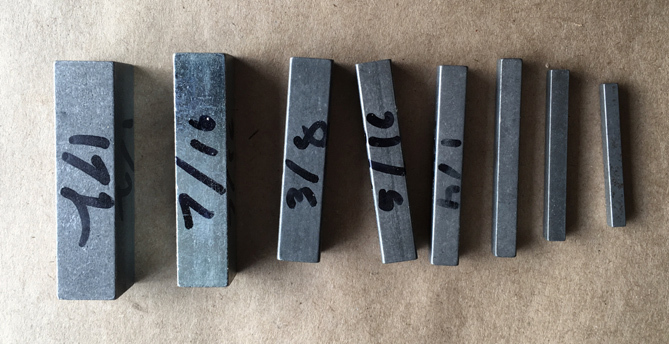 Shaft keys come in different flavors and shapes including curved, square and tapered. We’re looking for the square ones. Every hardware store has a set of shaft keys in a dusty, seldom opened drawer. My local store carried shaft keys between 1/8″ and 1/2″. You can buy a whole set for mere dollars. I used a sharpie to mark the dimensions of my set of shaft keys. I use them mostly for setting the depth of my router and table saw. Using your sense of touch, aided by a shaft key, is much more accurate than using your eyeballs and a ruler. But I also found them handy for assembling a new fence over the weekend. 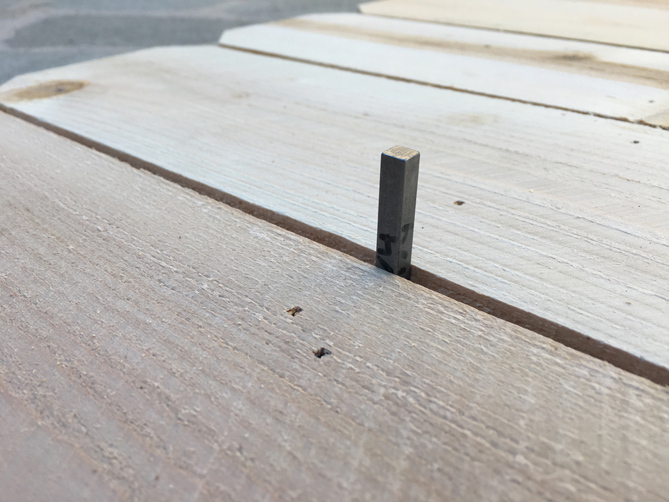 I wanted 1/4 inch gaps between the fence slats and used a shaft key as a spacer when I assembled the fence. Stuff the stockings of the accuracy challenged housemates on your Christmas shopping list with a set of shaft keys! Thank you to Bob Van Dyke for initiating me into the mysteries of the shaft key. I have lingering regrets about my choice of college degree. It’s not that I think that studying music wasn’t worthwhile, but rather that I was more invested in the idea of being a musician rather than the act of making music. And let’s not get into the plinky-plunky, modernist musical cat fight that passed for the musical curriculum at UCSD, where I did my graduate work. If I were to step into a time machine back to high school and ponder my next move I have no doubt that I’d ditch the University of California and head to Charleston, South Carolina to attend the American College of the Building Arts. ACBA was formed in the wake of hurricane Hugo, when local residents found that there were no skilled craftspersons to rebuild the traditional buildings that grace Charleston. Skilled workers had to be imported from Europe. The founders of ACBA set out to fix that problem by offering a four year degree that combines shop classes with the liberal arts. 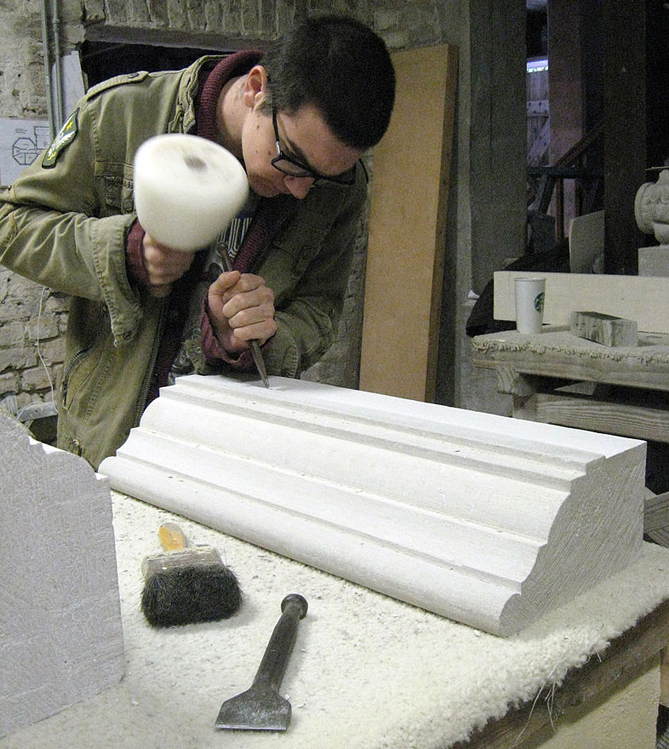 At ACBA you can study traditional building crafts such as masonry, timber framing, ironwork, plasterwork and classical architecture as well as English, Spanish, science and math. Many trade schools will teach you plumbing and stick framing, but few will teach you the things that ACBA offers. Garden & Gun magazine has an article on ACBA if you’d like to know more. Of course things worked out for me in the end. I met my wife Kelly at UCSD when I discovered that the art department grad students threw much better parties than the dour music department. Harvey Ellis was a gifted architect who worked for the furniture manufacturing firm owned by Gustav Stickley. His tenure at Stickley’s firm was brief but significant, bringing curves and ornament to Stickley’s sometimes blockly designs. He contributed work for the 1904 catalog and drawings for Stickely’s magazine The Craftsman before his untimely demise. We needed a dresser for our bedroom and Kelly and I really wanted the Ellis model. Unfortunately, not many were made and when they show up at auction they go for around $8,000 to $10,000. So I decided to build one myself and now I know why they cost so much. 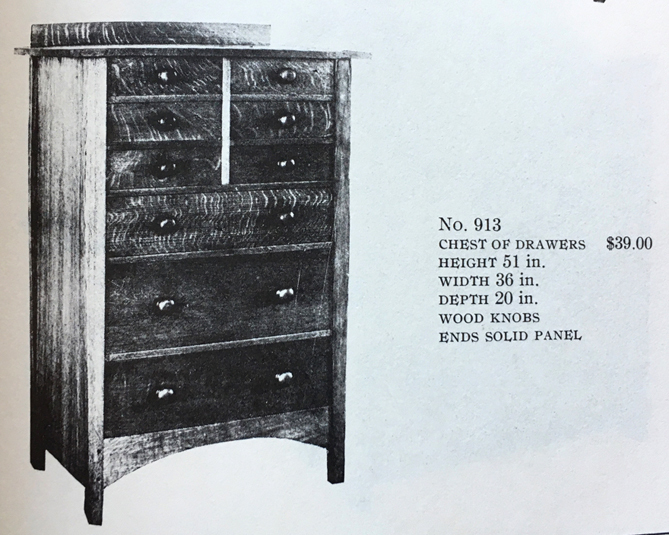 In 1904 the dresser sold for the princely sum of $39, over $1,000 in today’s dollars. Stickley simplified the design in subsequent years since the details in Ellis’ design make the dresser a bit of a pain to manufacture. But those subtleties are, in my opinion, worth the effort. Building this dresser was like being able to inhabit Ellis’ head temporarily to understand his design vocabulary. Ellis was clearly riffing on Shaker style cabinets. What makes it so special are the details. The legs not only taper towards the bottom but also subtlety taper towards the top. Ellis echoes this up and down tapering by changing the size of the drawers–bigger in the middle than at the top and bottom. Then there’s the graceful arch on the base and the paneled sides. All of these details make for a lot more work. It’s interesting to compare Ellis’ dresser to its Ikea equivalent. Ikea’s dresser isn’t terrible, design-wise, but you can tell that ease of manufacture is a primary consideration. And while I don’t want to romanticize early 20th century furniture work, I think I’d rather work in Stickley factory than Ikea’s. 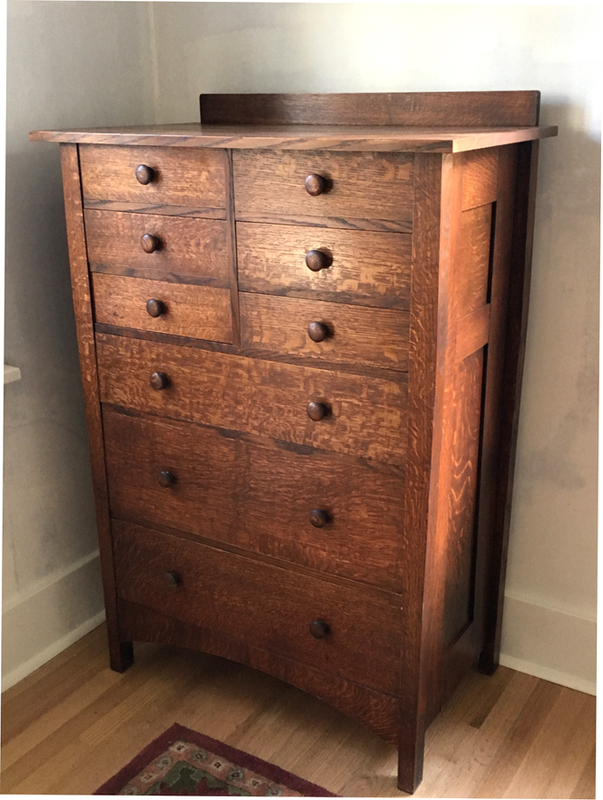 I made the Ellis dresser in much the same way it would have been built in 1904–mostly with machines (table saw, bandsaw etc.) but with hand planes for the fine work (fitting drawers, finishing surfaces). Late 19th and 20th century furniture making involves not just one task all day but a mix of responsibilities as well as aesthetic decisions such as deciding which way to run the grain. 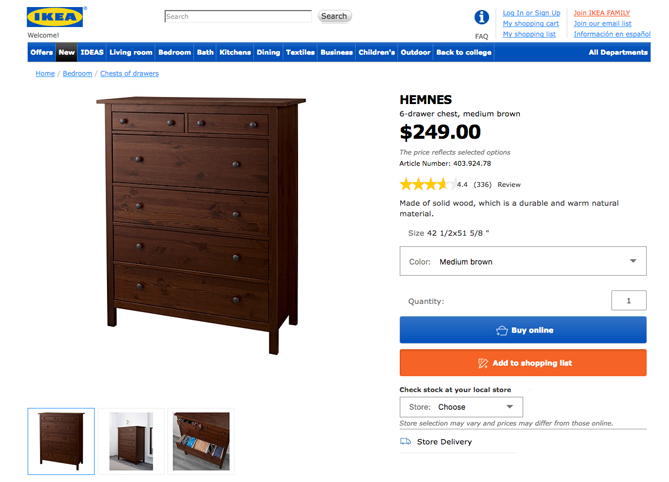 The Ikea dresser is made on a post-Henry Ford assembly line where workers either monitor machines and/or do the same repetitive task all day. This makes for a much cheaper product but an unhappy worker. I made many mistakes building my Ellis dresser. It was, by far, the most complex object I’ve ever built (including nine dovetailed drawers that had to be precisely fit to within 1/32 of an inch). I won’t bore you with the long list of errors, but the biggest one was not having a precise plan for the details of the inside of the dresser. There are many different ways to handle the inside of cabinets. There’s not one right way but it’s good to commit to a particular plan before you begin construction. I also could have done a better job matching the grain on the drawer fronts. If you’re interested in finish methods for this period of furniture I used these helpful directions and the accompanying video. Much to Kelly’s chagrin, Ellis mania has broken out in the house and I’m ignoring “important” work in order to build an Ellis bookshelf and china cabinet. Two years ago I decided to declutter some of my eclectic interests (goodbye beer making) and focus on upping my carpentry and woodworking skills. Partly, this was out of necessity. Our house needed some work and those skilled with planes and hammers are busy building custom staircases for Barbara Streisand and don’t have the time for a 980 square foot bungalow in the HaFoSaFo district. I took a few classes, subscribed to some woodworking and home building rags and I now spend my evenings pondering the grain orientation of drawers. 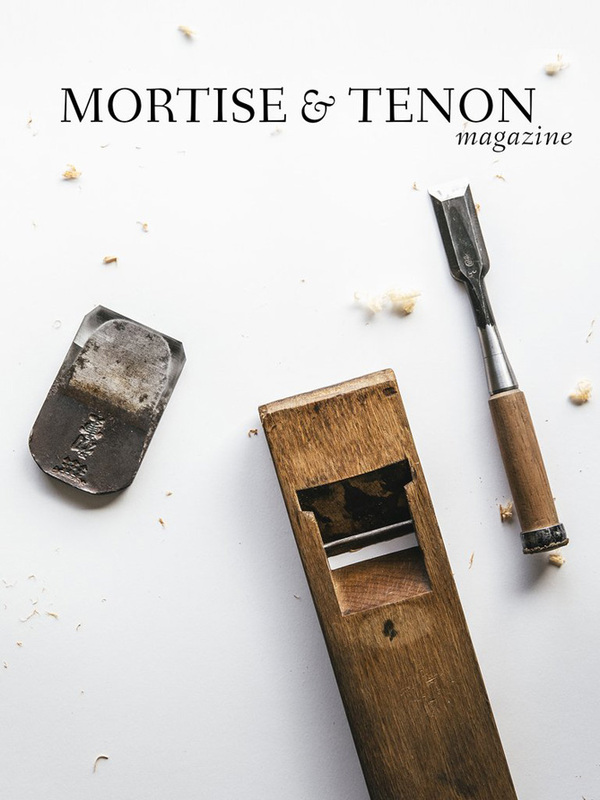 To further my interest in traditional woodworking, I just signed up for the twice a year Mortise and Tenon Magazine. As is fitting for a magazine that focuses on craftsmanship, Mortise and Tenon, edited by Joshua Klein, is itself a work graphic design artistry. In the current issue woodworker Kate Fox turns a neighborhood tree that had to come down into a Viking sea chest in a process she describes as, “four days of hard labor, one friend with a chainsaw, a scissor-jack pinched from my ’67 VW bug, lots of swear words, and a Costco bottle of ibuprofen.” In another article we get to see the inside joinery of a 18th-centry mahogany tea table. Two other articles focus on woodworking in apartments. I especially liked the article by Kim Choy who does some amazing work in a small apartment in Singapore. What was refreshing about his writing is that it was, basically, a long list of all the mistake he made in his self-educated attempt to build things with traditional Japanese tools. It’s a refreshing take in an era of Instagram boasting. Despite those mistakes and the limitations of Choy’s space, he manages to create large and very elegant furniture. My prediction: Mortise and Tenon is the new Wired (Un-Wired?). 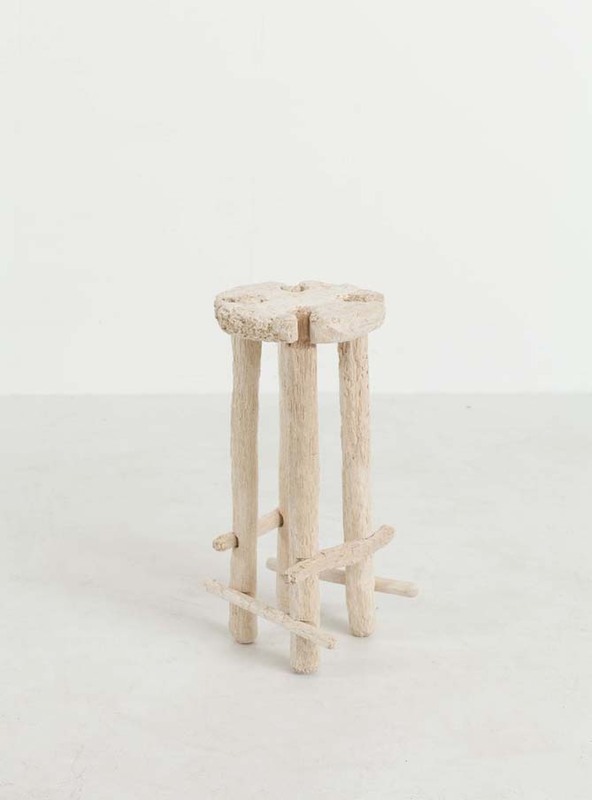 Designer Nikolas Bentel wanted to create a stool by hand . . . or better said by teeth. Not wanting to use any tools, he harvested wood by venturing up into New York’s Adirondack Mountains and rocked a dead Birch tree until if finally fell over. He then shaped the soft wood by slowly and methodically rubbing it with his hands, scratching it with his fingernails,, and chewing it with his teeth, in much the same way one tackles corn on the cob. “I got a few splinters along the way, but in ended up working out,” with all his teeth intact. You can find Bentel at All Purpose Nik.